Background and aims: This observational study assessed the long-term clinical benefit of infliximab (IFX) in 614 consecutive patients with Crohn’s disease (CD) from a single centre during a median follow-up of 55 months (interquartile range (IQR) 27–83). Methods: The primary analysis looked at the proportion of patients with initial response to IFX who had sustained clinical benefit at the end of follow-up. The long-term effects of IFX on the course of CD as reflected by the rate of surgery and hospitalisations and need for corticosteroids were also analysed. Results: 10.9% of patients were primary non-responders to IFX. Sustained benefit was observed in 347 of the 547 patients (63.4%) receiving long-term treatment. In 68.3% of these, treatment with IFX was ongoing and in 31.7% IFX was stopped, with the patient being in remission. Seventy patients (12.8%) had to stop IFX due to side effects and 118 (21.6%) due to loss of response. Although the yearly drop-out rates of IFX in patients with episodic (10.7%) and scheduled treatment (7.1%) were similar, the need for hospitalisations and surgery decreased less in the episodic than in the scheduled group. Steroid discontinuation also occurred in a higher proportion of patients in the scheduled group than in the episodic group. Conclusions: In this large real-life cohort of patients with CD, long-term treatment with IFX was very efficacious to maintain improvement during a median follow-up of almost 5 years and changed disease outcome by decreasing the rate of hospitalisations and surgery. Crohn’s disease (CD) is a disabling chronic relapsing inflammatory disorder of the bowel. Long-term experience with standard therapies for inflammatory bowel disease (IBD) up to the late 1990s demonstrated diverse limitations of these therapies in the treatment of IBD. Several population-based studies reported on the inability of corticosteroids to maintain remission, although these drugs have good short-term efficacy.1–5 Immunomodulators (IMMs) including azathioprine (AZA), its metabolite 6-mercaptopurine (6-MP) and the folate antagonist methotrexate (MTX) have a well-documented long-term efficacy in maintaining remission.6–10 Immunosuppression with AZA/6-MP is, however, of limited value for induction of remission, and fewer than half of the patients sensitive or resistant to steroids show long-term benefit.6–10 AZA or 6-MP treatment is also associated with an important risk of side effects. Although IFX has now been used in clinical practice for the treatment of CD for almost 10 years, there are few data published on its long-term efficacy beyond 1 year and on the durability of the effects of the drug and its impact on the long-term outcome of CD. Here we report on the real-life experience and the long-term outcome of IFX treatment in a consecutive series of 614 patients with CD treated at our referral centre. We specifically looked at maintenance of improvement, the ability to discontinue steroids, and the need for hospitalisations and surgery in comparison with the pre-IFX period. All patients had been followed according to a prospectively planned follow-up protocol. A total of 761 patients with IBD (614 patients with CD, 139 patients with ulcerative colitis and 8 patients with indeterminate colitis) received their first IFX dose between November 1994 and January 2007 at the University Hospital of Leuven. Long-term follow-up until the end of March 2007 was completed in all 614 patients with CD. The analysis of this study focused on the patients who responded to the drug within 10 weeks—that is, 547 patients. The majority of patients with CD were treated for luminal CD (n = 420, 68%), 170 patients were treated for fistulising CD (28%) and in 24 CD patients the main indication was extraintestinal manifestations (4%). Treatment was started on an episodic basis in 353 patients (64.5%), and 194 patients (35.5%) received scheduled treatment every 8 weeks from the start (fig 1). In 163 patients (29.8%) who received episodic treatment the regimen had to be switched to scheduled treatment due to loss of response after a median of 26 months (interquartile range (IQR) 12–47) and a median of six infusions (IQR 4–10) (fig 1). Most patients in the early years were treated episodically, which reflects patterns of clinical practice and local reimbursement policies at that time. Overall, 55 patients (8.96%) of the total cohort of 614 patients with CD had received IFX in different clinical studies. Only infusions with active IFX during the study and open infusions during follow-up were included in our analysis. Schedule of treatment with infliximab (IFX) in 614 patients with Crohn’s disease (CD). *After a median of 26 months (interquartile range (IQR) 12–47) and a median of six infusions (IQR 4–10). Patients’ baseline characteristics are listed in table 1. This is an observational study of a single-centre cohort where a prospectively designed standardised follow-up schedule was used for the follow-up of all patients by experienced clinicians. The primary analysis looked at what proportion of patients with an initial response to IFX showed sustained clinical benefit on IFX treatment throughout their entire follow-up. A secondary analysis concerned the number of interventions needed to keep the disease under control in the long term, the proportion of patients who had to stop IFX because of loss of response or side effects, and the proportion of patients who could discontinue IFX because they were in remission. Another goal of this study was to identify predictors for sustained clinical benefit. Furthermore, we analysed the rate of surgery and hospitalisations throughout the period after initiation of treatment with IFX in comparison with the rates prior to the start of this treatment. Sustained clinical benefit was defined as a lasting control of the disease activity during follow-up with persistent improvement of the symptoms. In patients treated episodically, relapse of CD symptoms triggered a repeated administration of IFX. IFX treatment was defined as episodic (on demand) if IFX was given only upon relapse of symptoms and it was defined as scheduled if IFX was intentionally planned every 8 weeks. Interventions included all therapeutic options involving dose increases of IFX necessary to keep the disease under control or to regain control, and included any shortening of the interval between IFX infusions (up to a minimum of 4 weeks) and/or an increase of the dose of IFX (maximum dose 10 mg/kg) as well as a change from episodic treatment to scheduled treatment with administration of the IFX infusions every 8 weeks. Any resection of a part of the gut, or strictureplasty for stenosing, or fistulising complications and faecal diversion (ostomy) were considered as major abdominal surgery (MAS). The rates were calculated per 100 patient years. Procedures such as abscess drainage or endoscopic dilatations were not counted. Acute infusion reactions were defined as any adverse events that occurred during or within 1 h after the infusion of IFX. All reactions occurring later were considered delayed infusion reactions. These were defined as serum sickness-like reactions when there was occurrence of myalgia, arthralgia, fever or rash, or any combination of these symptoms. Severe adverse events (SAEs) were defined as any adverse event that resulted in hospitalisation or prolonging of hospitalisation, was fatal or life threatening or led to significant disability. The initial response to IFX was assessed by experienced clinicians at 4 or 10 weeks after a single infusion or loading schedule, respectively. Patients who became completely symptom free were considered full responders to the IFX treatment. Patients who had distinct clinical improvement with an obvious decrease of the disease activity but who still had symptoms were considered partial responders. Patients who had no benefit after a median of two infusions discontinued treatment and were considered primary non-responders. Biological activity was also assessed in all the patients using C-reactive protein (CRP) levels at baseline and week 4 in the case of a single infusion and at week 10 in the case of induction treatment at weeks 0, 2 and 6. A drop in CRP levels of >50% between baseline and assessment time or normalisation of the CRP levels (<3 mg/l) was classified as a biological response. In this longitudinal observational cohort study, the SAS 9.1 statistical software package (SAS Institute, Cary, North Carolina, USA) and the SPSS 15.0 software (SPSS, Chicago, Illinois, USA) were used to perform all appropriate statistical analyses. Medians with the IQR were calculated for continuous data and percentages were computed for discrete data. The SAS procedure GENMOD was used to analyse count data. The sustained clinical benefit of IFX was estimated by Kaplan–Meier analyses in SPSS. These were verified and complemented by analyses in SAS, adopting the procedure LIFETEST and procedure PHREG for Cox proportional hazards analysis. To compare hazard rates in populations defined by one variate at a time, both the Breslow and the Logrank tests were used. 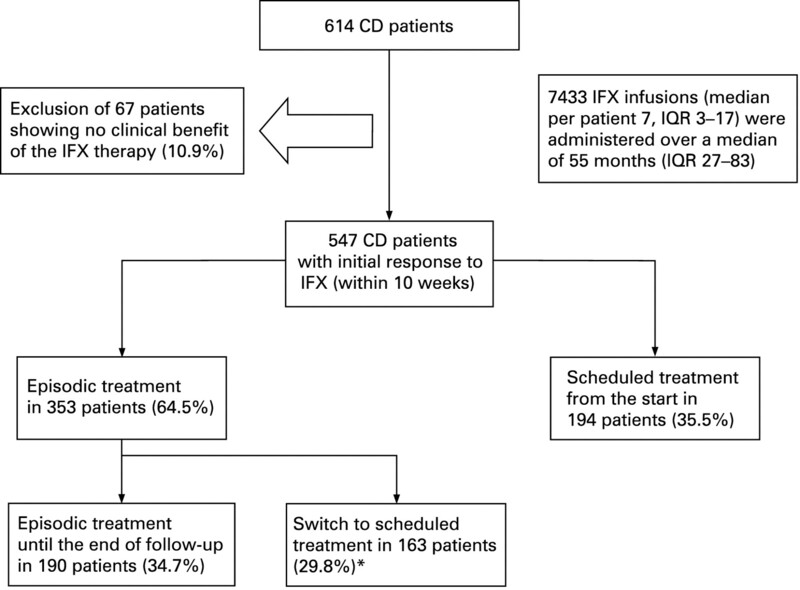 Over a median of 4.6 years (IQR 2.3–6.9) or 55 months (IQR 27–83) a total of 7433 IFX infusions were administered to 614 patients with CD (fig 1). Patients receiving episodic IFX treatment throughout (n = 190) received overall 1009 IFX infusions during a median follow-up of 5.9 years (IQR 4.0–7.2) with a median of 0.8 infusions (IQR 0.4–1.3) and a median total dose of 260 mg of IFX per patient year (IQR 131–452). Patients with a switch from episodic to scheduled treatment in the long term (n = 163) received overall 3806 infusions during a median follow-up of 6.2 years (IQR 4.5–7.4) with a median of four infusions (IQR 3–5) and a median total dose of 1456 mg of IFX per patient year (IQR 757–1794). Patients receiving scheduled treatment from the start (n = 194) received overall 2442 infusions during a median follow-up of 1.9 years (IQR 0.9–3.4) and with a median of seven infusions (IQR 4–8) and a median total dose of 2134 mg of IFX per patient year (IQR 1298–2679), respectively. Overall, 547 (89.1%) patients with CD had a clinical improvement of their symptoms after the initiation of the IFX treatment. A total of 295 patients (48.1%) showed partial response and 41.0% (n = 252) had full response. 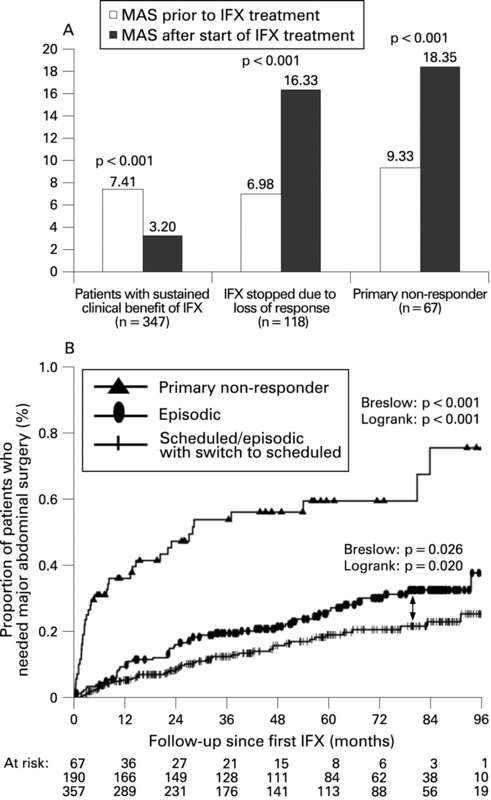 A total of 67 patients (10.9%) had no initial response to IFX, and IFX was discontinued early after a median of two infusions (IQR 2–3) (figs 1 and 2). Outcome of treatment of patients with Crohn’s disease (CD) with infliximab (IFX) and reasons for its discontinuation. CRP levels at baseline and at follow-up were available in 481 patients with CD with an initial response to IFX. The majority of these patients had an increased CRP level at baseline (>3 mg/l, n = 401, 83.4%). The median CRP level at baseline was 12.9 mg/l (IQR 5.0–32.4) and decreased to 2.1 mg/l (IQR 1.5–7.3) at follow-up at week 4 or 10. A total of 309/401 patients (77.1%) responded biologically to IFX, including 186 patients (46.4%) displaying a decrease in CRP back to normal values (<3 mg/l) and 123 patients (30.7%) with a drop in CRP of >50%. Eighty patients (80/481, 16.6%) already had normal CRP levels (<3 mg/l) at baseline. Ninety-two patients (92/401, 22.9%) showed no CRP decrease. 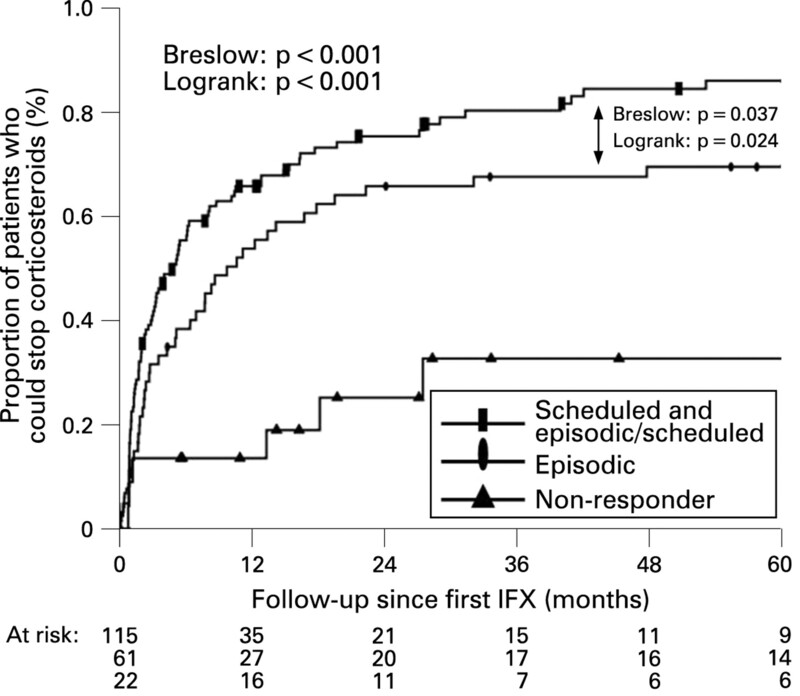 At the end of follow-up in March 2007, 347 of the 547 initial responders to IFX (63.4%) showed sustained clinical benefit from IFX (figs 2, 3A and 4A). Of these, 237 patients (43.3%) were still receiving IFX with sustained control of disease activity, while in 110 CD patients (20.1%, 63 with luminal CD, 42 with fistulising CD and 5 mainly with extraintestinal manifestations), IFX treatment had been stopped after a median of 6.2 months (IQR 1.4–16.6) and a median of four infusions (IQR 2–7), while the patients were in remission. They stayed in remission for a median of 47.3 months (IQR 20.8–66.4) after stopping IFX treatment. 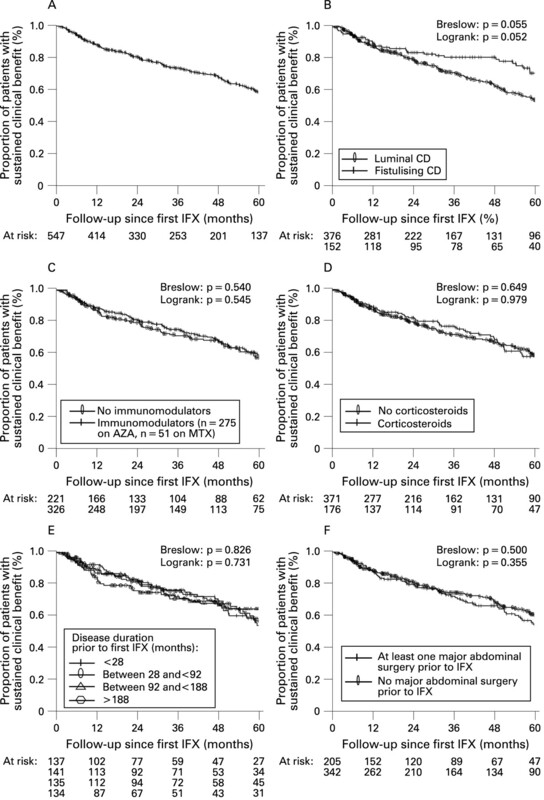 Sustained clinical benefit of infliximab (IFX) in patients with Crohn’s disease (CD) who initially responded to the IFX treatment in the overall cohort (A) and stratified by indication for the IFX treatment (B), concomitant treatment with immunomodulators at baseline (C), concomitant treatment with corticosteroids at baseline (D), duration of the disease prior to the IFX treatment (E) and history of major abdominal surgery prior to the IFX treatment (F). AZA, azathioprine; MTX, methotrexate. Sustained clinical benefit of infliximab (IFX) in patients who initially responded to the IFX treatment and stratified by treatment regimen (A), baseline C-reactive protein (CRP) levels (B) and drop of CRP levels in patients with an increased baseline CRP level (C). Overall, 76.25% of patients with normal baseline CRP levels received concomitant immunomodulators (IMMs) at baseline (n = 61, 56 received azathioprine (AZA) and 5 received methotrexate (MTX)), and 31 of them were also treated with corticosteroids (CS) (38.75%). A total of 55.11% of patients with elevated baseline CRP levels received concomitant IMMs at baseline (n = 221, 187 patients AZA and 34 patients MTX) and 30.92% (n = 124) of them received CS at baseline. The great majority of these 110 patients, namely 81 (73.6%), were treated episodically with IFX and did not receive re-treatment because they stayed in remission. Nineteen (17.3%) had been on scheduled treatment and 10 (9.1%) had been switched from episodic to scheduled treatment and IFX was discontinued because of the doctor’s or patient’s decision. After stopping the IFX treatment, 92 of the 110 patients (84%) continued on IMMs (75 patients with AZA, 17 with MTX). A total of 67 of these patients (61%) were already receiving IMMs at the start of IFX, whereas in 25 patients, IFX and AZA (n = 20) or MTX (n = 5) had been started simultaneously (23%) and IFX was used as a bridging treatment and was stopped after a median of two infusions (IQR 1–3). Eighteen patients had received IFX without any concomitant IMM treatment and were able to stop IFX while in remission without any maintenance treatment. Overall, 200/547 patients (36.6%) stopped IFX, due to loss of response (n = 118, 21.6%), side effects (n = 70, 12.8%) or for other reasons (n = 12, 2.2%) (fig 2). A total of 39.7% of patients who had started on episodic treatment (140/353) had to stop IFX treatment compared with 24.7% of patients (48/194) receiving scheduled treatment from the start. While the proportion of patients who had to stop IFX due to loss of response was comparable for both groups (22.9% (n = 81) in the episodic group vs 19.1% (n = 37) in the scheduled group; p = 0.3286, Fisher exact test), significantly more patients in the group treated episodically had to stop because of side effects as compared with patients receiving scheduled treatment from the start (n = 59/353, 16.7% vs n = 11/194, 5.6%; p = 0.0001, Fisher exact test). The median time to drop-out from IFX treatment was 79.1 months (IQR 67.1–91.0) for the patients who started on episodic treatment (n = 353). Since the median survival time is defined as the lowest survival time for which the survivor function is ⩽50%, and since the survivor function for the scheduled treated group (n = 194) does not fall below 50%, the median time to drop-out from IFX for the scheduled group cannot be estimated. Thus, only the mean time to drop-out from IFX can be given for this group, namely 64.8 months (range 57.0–72.6). Although the presented estimated mean survival times do take into account censoring, they are underestimates of the true means. The median drop-out rate from treatment per year was 10.7% (IQR 7.1–14.3) for the episodic group and 7.1% (IQR 0.0–8.6) for the scheduled group. 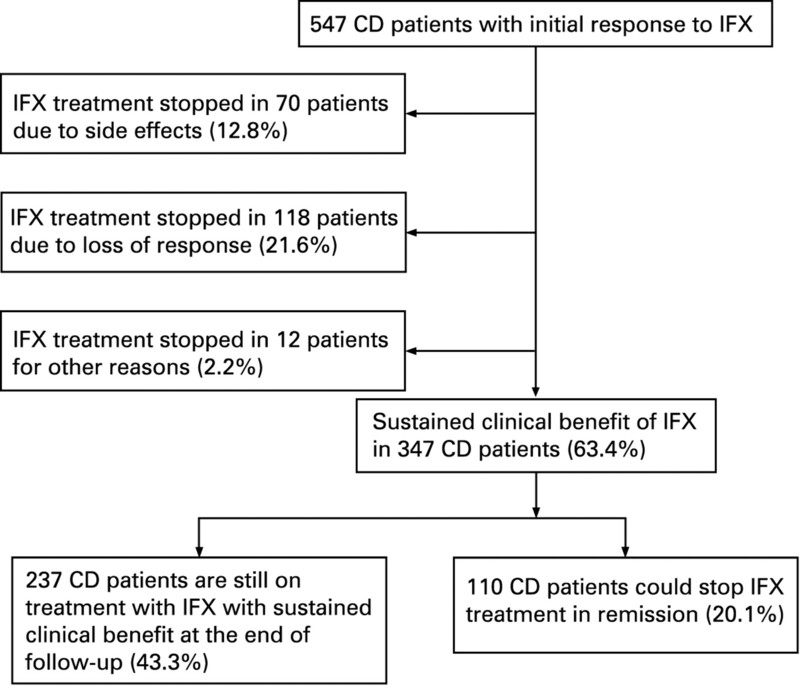 In 70 of 547 CD patients, IFX treatment was discontinued because of side effects after a median of five infusions (IQR 3–11) and after a median duration of 29.5 months (IQR 8.3–53.0). These included acute infusion reactions in 15 patients (15/547, 2.7%) and delayed infusion reactions in 33 CD patients (33/547, 6.1%). Other SAEs occurred in 22 patients with CD (22/547, 4.0%): four patients had to stop IFX due to serious acute infusion reactions and 9 patients because of serious delayed infusion reactions. Serious infections were diagnosed in 5 patients, including an infection with herpes zoster, an abdominal tuberculosis infection and an Aspergillus infection. The Aspergillus infection was lethal and was considered to be directly related to the IFX treatment. One sudden death occurred during the IFX treatment but was not considered to be related to the IFX treatment. Three patients had to stop IFX because of neurological complications (one patient with a not proven neuritis optica, one patient with a diagnosed central demyelinising lesion and one patient with extensive multiple sclerosis-like neurological symptoms). A total of 118 CD patients (21.6%) presented with a loss of response to treatment with IFX and failure of dose increase interventions. IFX treatment was stopped in these patients after a median of eight IFX infusions (IQR 4–14) and after having been receiving treatment with IFX for a median of 21.5 months (IQR 8.8–42.4). Sixty patients (n = 60/118, 50.8%) were either switched to adalimumab (Humira, Abbott Laboratories North Chicago, Illinois, USA) (n = 50/118, 42.4%) or they were included in studies with the pegylated anti-TNF antibody fragment certolizumab (Cimzia, UCB Group, Brussels, Belgium) (n = 10/118, 8.5%). Twelve patients were included in studies with other biological agents (10.2%), 32 patients with CD (27.1%) underwent surgery and 14 patients (11.9%) received rescue treatment, mainly with steroids. Of the 547 initial responders, 12 patients (2.2%) discontinued IFX treatment for different reasons, including pregnancy, moving abroad, patient’s preference, problems with funding, diagnosis of breast cancer and relapse of hepatitis B after a median of three infusions (IQR 3–7) and a median of 15.2 months (IQR 5.9–31.0). Ten patients died during the median follow-up of 55 months. The median age at death was 58 years (range 35–83). Seven patients died after they had already stopped IFX for a median of 29 months (range 5–66). One patient died during IFX treatment due to an Aspergillus infection, and one sudden death occurred. In a 45-year-old woman a pancreatic carcinoma was diagnosed 1 month after her last IFX infusion and she died 5 months after the diagnosis and outside of the observational period of our study. The death due to Aspergillus infection was considered to be directly related to IFX treatment; three deaths were considered possibly related and six deaths were unrelated. Of the 547 initial responders, 50% (n = 273) did not need any intervention, whereas 26% (n = 143) needed one intervention, 10% (n = 56) needed two and 14% (n = 75) needed ⩾3 interventions. Of the patients who were started on episodic IFX treatment (n = 353, fig 1), 163 (46%) had to switch to treatment every 8 weeks after a median of 26 months (IQR 12–47) and/or six infusions (IQR 4–10) (fig 1). A reduction of the interval between the infusions became necessary in 108 patients (19.7%), an increase of the dose to 10 mg/kg and/or a re-induction with IFX infusions at weeks 0, 2 and 6 in 144 patients (26.3%, 63 patients with a re-induction and 89 patients with an increase of the dose of IFX) or an increase of the dose plus a reduction of the interval in only 21 patients (3.8%). Overall, 103 of the 144 patients (71.5%) with an increase in dose and/or a re-induction with IFX were able to go back to the standard dose of 5 mg/kg, and 61.9% of patients (13/21) with an increase of dose and a shortening of the interval were able to go back to 5 mg/kg and treatment every 8 weeks. A total of 28.7% of patients with a shortened interval between the infusions (31/108) could again extend the interval to 8 weeks. In the total cohort of initial responders, only 21.6% (n = 118) had to stop IFX because of loss of response, despite interventions. A total of 198 patients received corticosteroids at baseline (32.2%). The majority (n = 141, 71.2%) could definitively stop corticosteroid treatment after a median of 12 weeks (IQR 5–36) and a median of two IFX infusions (IQR 1–3) with no need for re-treatment (fig 5). The proportion of patients who were able to stop was significantly higher in the group receiving scheduled treatment and in the group of patients who were switched to scheduled treatment than in the group who received episodic treatment throughout (p = 0.024, fig 5). Also the time to complete withdrawal of corticosteroids was shorter in patients who were treated every 8 weeks with IFX (median 8.7 weeks, IQR 5–26), as compared with patients who started IFX episodically (median 15 weeks, IQR 6–51) (p = 0.057, Mann–Whitney U test). In contrast, only 27.3% (6/22) of patients with no short-term clinical benefit of IFX treatment were able to stop corticosteroids (Logrank: p<0.0001, fig 5). Ability to wean patients off steroids in those treated with corticosteroids at baseline stratified by the initial response to infiximab (IFX) and by treatment schedule. Half of the patients were on AZA at baseline (n = 305, 49.7%) and 58 patients (9.4%) were on MTX. One-third of patients on AZA at baseline (n = 104, 34.1%) stopped AZA after a median of 15 months (IQR 6–31) and a median of six infusions (IQR 3–11). Of these, 61 patients (58.7%) stayed off immunosuppression until the end of follow-up, and 43 patients (41.3%) were switched to concomitant MTX treatment. Half of the patients on MTX at baseline (n = 28, 48.3%) stopped MTX after a median of 14 months (IQR 6–33) and a median of four infusions (IQR 3–6), 82.1% (n = 23, 82.1%) stayed off IMMs until the end of follow-up, and five patients (17.9%) were switched to concomitant AZA. Overall, 116 of the 363 patients (32%) who received IMMs at the start were able to stop the IMM treatment after a median of 25 months (IQR 11–53) and a median of six infusions (IQR 3–12) with no need for re-treatment in the long-term. A hospitalisation rate of 42.3% (260/614) was observed after starting IFX. More patients started on episodic treatment required hospitalisation (46.7%, 165/353, median follow-up 72.6 months, IQR 50.9–87.1) compared with patients receiving scheduled treatment from the start (25.7%, 50/194, median follow-up 22.9 months, IQR 11.0–41.1; p<0.001). The number of hospitalisations per patient was also higher in those receiving episodic treatment (median 2, IQR 1–4) than in patients on scheduled treatment (median 1, IQR 1–2). The highest hospitalisation rate of 67.2% (45/67) was observed in patients who had to stop IFX prematurely because of no clinical benefit of the treatment. A total of 23.5% (144/614) of patients needed MAS during IFX treatment. Initial response to IFX and sustained clinical benefit of IFX up to the end of follow-up were associated with a significant decrease in the need for MAS after the initiation of the IFX treatment (p<0.001, fig 6A). Primary non-response to IFX or loss of response were associated with a significant increase in the need for MAS (p<0.001, fig 6A). Patients with scheduled infusions every 8 weeks from the start and patients who were switched from episodic to treatment every 8 weeks with IFX had a significantly lower need for MAS in the long term compared with patients with an episodic treatment regimen until the end of follow-up (Logrank: p<0.020, fig 6B). Need for major abdominal surgery (MAS) in infliximab (IFX)-treated patients. The number of MAS per 100 patient years before initiation of IFX as compared with after the start of IFX and stratified by long-term response to IFX (A), and timetable of proportions of patients needing MAS stratified by treatment schedule and response to IFX treatment (B). A decrease in elevated baseline CRP levels back to normal values (<3 mg/l) after initiation of IFX treatment was significantly associated with a better outcome of IFX treatment in the long term (Logrank: p = 0.001, fig 4C). Absence of short-term clinical benefit of IFX treatment was associated with a significantly greater need for MAS and with decreased ability to stop corticosteroid treatment in the long term (Logrank: p<0.001, figs 5 and 6A,B). Other factors including the indication for IFX treatment, concomitant treatment with IMMs or with corticosteroids at baseline, disease duration prior to the initiation of the IFX treatment, prior history of MAS or CRP level at baseline did not have an influence on the outcome of IFX treatment in the long term (figs 3B–F and 4B). To date, there are only limited data available on the long-term outcome of IFX treatment for CD in clinical practice. A few studies reported on a durable efficacy of IFX also beyond 1 year,17–19 but the size of the cohorts was small, the follow-up limited and not all patients treated were followed long term. The present study assessed the long-term efficacy of IFX treatment in a large cohort of patients with CD with a median follow-up of almost 5 years. All patients who have been treated with IFX between November 1994 and March 2007 were included in our study and were followed in a prospectively designed follow-up schedule. The short-term response rate in this study (within the first 10 weeks) is higher than that reported in the initial randomised placebo-controlled trials and in the ACCENT I and II trials.11–14 This is without doubt due to the lack of well-defined criteria for (non-) response using the Crohn’s Disease Activity Index (CDAI) so that all patients who showed some clinical benefit were allocated to scheduled treatment. In a small study, Pearce et al found comparable initial response rates. In that study, 75% of patients with luminal CD responded at 8 weeks to a single dose of IFX as did 92.9% of patients with IFX at 0, 2 and 6 weeks.20 In comparison, the response rates in our study at week 10 for patients who received induction infusions at weeks 0, 2 and 6 (29.6%, n = 182) and for patients who received a single infusion (70.4%, n = 432) were not significantly different (92.3% response rate to IFX for patients with an induction scheme vs 87.7% for patients with a single infusion, p = 0.12, Fisher exact test). The present analysis shows excellent efficacy of IFX treatment to maintain improvement not only during 1 year as in the published trials,11–14 but also during a median follow-up of 4.6 years. Indeed, almost two-thirds of the initial responders to IFX in our cohort (63.4%) maintained benefit until the end of their follow-up. The efficacy of treatment was similar for luminal and fistulising disease, and other baseline characteristics, such as concomitant immunosuppression, duration of disease and prior surgery did not influence outcome. The drop-out rate from IFX treatment was not different for patients started on episodic treatment compared with patients receiving scheduled treatment from the start. However, patients in the episodic group always needed to suffer a relapse of symptoms before they were given a repeat infusion. On the other hand, episodic treatment allowed us to identify an important proportion of patients who could discontinue treatment without suffering a relapse. The majority of these patients remained on immunosuppression. The total dose of IFX administered was very low in patients who stayed on episodic treatment throughout. There was not much difference in total dose between patients who were started on scheduled treatment and patients who had to switch from episodic to scheduled treatment. We could not identify predictors for a long-lasting response in our episodic cohort. Given their important side effects in the long term, corticosteroid sparing is one of the most important treatment aims in the long-term treatment of CD. The ACCENT I study demonstrated the steroid-sparing effect of IFX over a 1 year period.12 In the present cohort, steroid withdrawal was possible in >70% of patients taking steroids at baseline, which is more than reported in the ACCENT I study. In our study, these patients also stayed off steroids during their further follow-up. Patients who received scheduled treatment from the start or were switched from episodic to scheduled treatment were able to stop steroids more frequently and earlier than patients who were treated episodically throughout. The ACCENT I and ACCENT II studies showed that scheduled treatment with 8 weekly IFX in responders is associated with a lower need for hospitalisations and surgical interventions over a follow-up period of 1 year compared with episodic treatment.12 13 15 Our study shows that the outcome of CD is also altered over the course of several years. The rate of hospitalisations and surgery was lowest in the patients who were treated in a scheduled regimen and the rate of surgery was significantly decreased in comparison with the rate in the same patients prior to initiation of IFX. In contrast, patients who did not respond to IFX or who lost response and discontinued IFX often needed surgery, and the rate of surgical interventions in these patients was significantly increased in comparison with that before starting IFX. The majority of patients with CD treated with IFX (63.4%) in this cohort showed sustained clinical benefit during a median follow-up of almost 5 years. Although episodic treatment was effective, more than half of the patients who started with episodic treatment needed to be switched to scheduled treatment. Moreover, scheduled treatment was more effective than episodic treatment for steroid withdrawal and avoidance of hospitalisations and surgery. We feel therefore that scheduled treatment should be preferred for optimal disease control in patients with CD. However, one in three patients who are started on episodic ITX can discontinue therapy while staying in remission with continued immunosuppression treatment, but we could not identify predictors for this favourable outcome. To date, no rules regarding stopping treatment have been identified in patients treated with scheduled IFX. This study reflects real-life experience with IFX treatment in CD in daily clinical practice. The excellent long-term outcome in the present cohort may be explained by careful patient selection. Close standardised monitoring of clinical symptoms and laboratory findings in the patients during follow-up at regular scheduled visits allowed optimal adjustment of the IFX treatment to the disease activity, which led to improved long-term outcome. FS received an ECCO (European Crohn's and Colitis Organisation) fellowship and an educational grant from Centocor bv.
. Frequency of glucocorticoid resistance and dependency in Crohn’s disease. Gut 1994;35:360–2.
. Disease activity courses in a regional cohort of Crohn’s disease patients. Scand J Gastroenterol 1995;30:699–706.
. The natural history of corticosteroid therapy for inflammatory bowel disease: a population-based study. Gastroenterology 2001;121:255–60.
. Clinical course of colorectal Crohn’s disease: a 35-year follow-up study of 507 patients. Gastroenterology 1998;114:1151–60.
. Budesonide prolongs time to relapse in ileal and ileocaecal Crohn’s disease. A placebo controlled one year study. Gut 1996;39:82–6.
. A controlled double blind study of azathioprine in the management of Crohn’s disease. Gut 1995;37:674–8.
. Long-term follow-up of patients with Crohn’s disease treated with azathioprine or 6-mercaptopurine. Lancet 1996;347:215–9.
. Treatment of Crohn’s disease with 6-mercaptopurine. A long-term, randomized, double-blind study. N Engl J Med 1980;302:981–7.
. Methotrexate for the treatment of Crohn’s disease. The North American Crohn’s Study Group Investigators. N Engl J Med 1995;332:292–7.
. A comparison of methotrexate with placebo for the maintenance of remission in Crohn’s disease. North American Crohn’s Study Group Investigators. N Engl J Med 2000;342:1627–32.
. A short-term study of chimeric monoclonal antibody cA2 to tumor necrosis factor alpha for Crohn’s disease. Crohn’s Disease cA2 Study Group. N Engl J Med 1997;337:1029–35.
. Maintenance infliximab for Crohn’s disease: the ACCENT I randomised trial. Lancet 2002;359:1541–9.
. Comparison of scheduled and episodic treatment strategies of infliximab in Crohn’s disease. Gastroenterology 2004;126:402–13.
. Infliximab for the treatment of fistulas in patients with Crohn’s disease. N Engl J Med 1999;340:1398–405.
. Infliximab maintenance therapy for fistulizing Crohn’s disease. N Engl J Med 2004;350:876–85.
. Scheduled maintenance treatment with infliximab is superior to episodic treatment for the healing of mucosal ulceration associated with Crohn’s disease. Gastrointest Endosc 2006;63:433–47.
. Infliximab dependency in pediatric Crohn’s disease: long-term follow-up of an unselected cohort. Inflamm Bowel Dis 2008;14:353–8.
. Efficacy of infliximab in Crohn’s disease. Results of a retrospective multicenter study with a 15-month follow-up. Gastroenterol Clin Biol 2006;30:247–52.
. Long-term durability of Crohn’s disease treatment with infliximab. Dig Dis Sci 2008;53:1033–41.
. Careful patient selection may improve response rates to infliximab in inflammatory bowel disease. J Gastroenterol Hepatol 2007;22:1671–7.
. Long-term safety of infliximab in the treatment of inflammatory bowel disease: a single center cohort study. J Crohn’s Colitis Suppl 2007;1:3.